Have you ever received good advice that you were unable to follow? Has your doctor ever recommended a lifestyle change that you found to be unsustainable? Have you ever wanted something in your life, but found you couldn’t achieve it alone? Have you ever wanted to try your hand at health, nutrition, and weight loss programs? 2, 30 minute phone sessions. Sugar buster eating plan to reduce craving and balance blood sugar. 1 pantry purge or supermarket shopping trip. E- book 5 food 5 herbs 5 nutrients to reverse diabetes. Diabetic reversal meet-up group support. 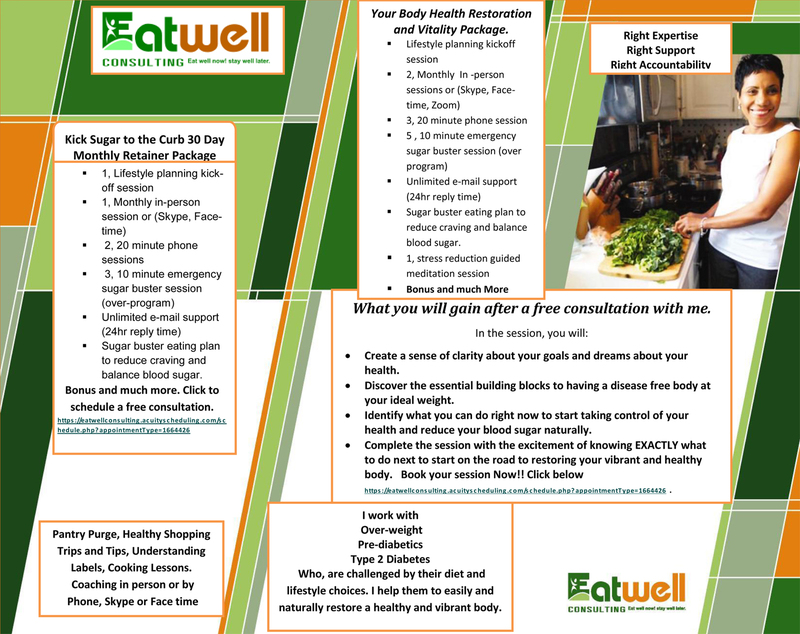 Monthly newsletter with weight loss and diabetic reversal tips and tricks. Significant weight loss 10-25 lbs. Balance Sugar levels below 90. Reduction for the need of medication. Feel good about your health and new level of vibrancy. Continue to make choices that will improve your life. 2, 20 minute phone session. Subscription to Eating well magazine. 7 Day Do your self- guided sugar detox. 1 Pantry Purge and Shopping Trip. Create a sense of clarity about your goals and dreams about your health. Discover the essential building blocks to having a disease free body at your ideal weight. Identify what you can do right now to start taking control of your health and reduce your blood sugar naturally. Complete the session with the excitement of knowing EXACTLY what to do next to start on the road to restoring your vibrant and healthy body.